A custom (especially local) CDN provider is useful in cases where the application runs on an Intranet or the client machines are otherwise restricted from reaching the cloud where the Telerik CDN is hosted. In case you want to use your own CDN provider for hosting the Telerik UI for ASP.NET AJAX script / css files you need to follow the steps below. Obtain the CDN resource package for your controls version. 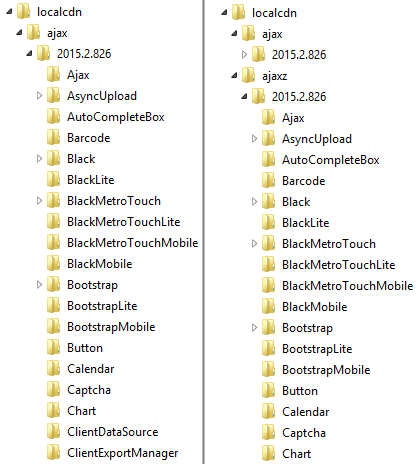 For example, Telerik_UI_for_ASP.NET_AJAX_2015_2_826_CDN_Resources.zip. This file is available in your account and can be found in the Downloads section where all product files for the UI for for ASP.NET AJAX product are located. The location may vary slightly depending on your subscription. Expires - 1 year from the date of the request, if set dynamically. Far-future date (10 years) if set statically. The solution is fully applicable also for creating a local CDN. Just copy the Scripts and Skins folders inside a folder in the root of your application and configure the BaseUrl and BaseSecureUrl to point to the resources folder. If you are using non-IIS CDN hosting service configuration might be different.